As our growing season begins to wane, it’s time to think about preparing our beds for winter. Experienced gardener Janet Peterman offers a few tips for fall cleanup and winter prep that benefit you and your fellow gardeners. 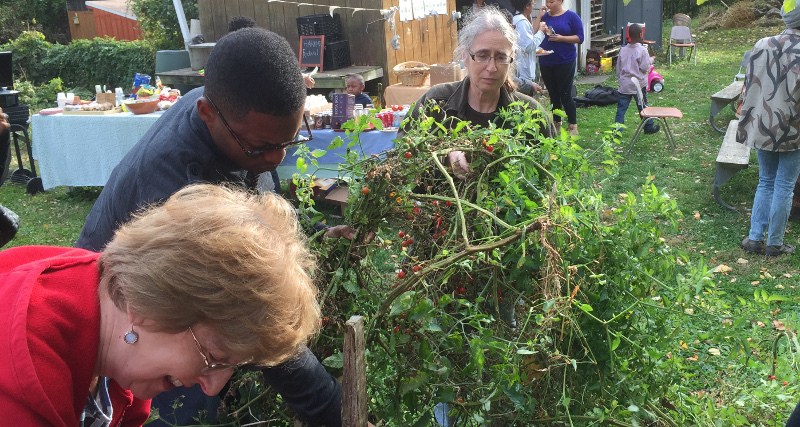 According to our membership agreement, Hansberry gardeners must clean out their beds by Nov. 1. If you wish to continue growing crops or plant overwintering crops (such as garlic), you must notify the board and ask for an exemption. Any produce remaining in unexempted beds after Nov. 1 will be harvested for the City Harvest program. Get a head start. Even if you plan to continue growing some of the items in your bed, you don’t have to wait to clear it all out at once. Prune the sickly parts. If your tomato or squash is still bearing and you’d rather not harvest immature fruit, cut off the wilted and spotted stems or leaves. Discard diseased plants in the trash, not the compost pile. Anything with fungus, such as tomato blight or wilt, should not be composted. Composting disease spores compromises beds that will use the compost next year. Compost plants not affected by disease. If a plant has died from insufficient water or simply reached the end of its life cycle without suffering from blight, wilt, or other disease, please compost it! Remove seed heads and avoid composting them. Many of our favorite plants are hybrids, or mixtures of two parent plants. Seeds from a hybrid will produce plants of the parental strain — so, for example, a hybrid beefsteak tomato seed might produce a plant that bears tiny cherry tomatoes. These “volunteer” plants often grow very aggressively and are difficult to manage. Weed around your bed. HGNC gardening members are responsible for keeping the paths around their boxes passable and free of weeds. Plant a cover crop. You can plant a crop, like clover, that fixes nitrogen to enrich your soil. In the spring, you’ll turn these plants over into your bed’s dirt. In previous years, the Pennsylvania Horticultural Society has donated cover-crop seeds. We’ll let you know if and when the PHS provides seeds again this year.